We’d love your help. Let us know what’s wrong with this preview of Misfit Table by Tiffini Kilgore. Too often the world speaks words of harm, and too often we believe them--and so we live stories God never intended for us. Yet God longs to rewrite and redeem your story. Tiffini Kilgore, founder of the lifestyle and design boutique House of Belonging, grew up in a broken home before marrying at the tender age of sixteen. Years later, divorced and with three small children, Too often the world speaks words of harm, and too often we believe them--and so we live stories God never intended for us. Yet God longs to rewrite and redeem your story. Tiffini Kilgore, founder of the lifestyle and design boutique House of Belonging, grew up in a broken home before marrying at the tender age of sixteen. Years later, divorced and with three small children, she remarried. The seasons that followed brought two more children, another broken marriage, chronic disease, major surgeries, and cycles of abuse--leaving Tiffini feeling alone and unloved. Hungry for healing and a safe space, Tiffini began seeking Jesus through journaling and soon found bread crumbs of grace leading her down a new path. There, she found a rich table set for misfits just like her--a place of nourishment and restoration. Where she was fed lies of worthlessness, God fed her truth that she was his treasured daughter. Where she was told she was a helpless victim, God offered her the cup of his strength. Where she once held an empty future, God gave her hope and a fresh start. In cultivating an ongoing dialogue with her Abba Father, God transformed Tiffini's pain into passion, and ultimately, fierce belonging. To ask other readers questions about Misfit Table, please sign up. "Tiffani shares a story that so many have along with the providence of Gods hand along the journey. She shares the raw truth and honest hurt from a childhood that left such pain, emptiness, searching for a home. This testimony will bring healing to so many that have walked this road and found redemption along the way to restoration. Her book is a must read for all to have an insight into the reality of so many along with the hope that can give life to what may seem dead. Read it, use it as encou "Tiffani shares a story that so many have along with the providence of Gods hand along the journey. She shares the raw truth and honest hurt from a childhood that left such pain, emptiness, searching for a home. Her book is a must read for all to have an insight into the reality of so many along with the hope that can give life to what may seem dead. Read it, use it as encouragement as you serve to allow Jesus to heal the broken with your words, heart, and actions. If you are looking for a place to belong, this is the book for you! Tiffini took her life experiences and shared them in a way that made me feel welcome in her circle and shared how God also welcomes us no matter who or where we are. Tiffani’s story is one of brokenness and hope, grief and joy. She wrote her story in such a way that moved me. My heart broke for her but at the same time rejoiced over the Father that kept bringing her back to Him and His table. I am so honored that I was able to read her story. I am grateful for the raw honesty and truth in this book! I have followed Tiffini and her journey over the past 6 years. Watching and listening to her story in bits and pieces was captivating and left me longing for more. Her memoir about brokenness, healing, forgiveness, love and redemption is the complete story. To read the words of her life journey from beginning to now has been both heart breaking and inspiring yet empowering. The author uses the craft of simultaneous dialogue to give the reader a sense of what was happening in her outer world and I have followed Tiffini and her journey over the past 6 years. Watching and listening to her story in bits and pieces was captivating and left me longing for more. Her memoir about brokenness, healing, forgiveness, love and redemption is the complete story. To read the words of her life journey from beginning to now has been both heart breaking and inspiring yet empowering. The author uses the craft of simultaneous dialogue to give the reader a sense of what was happening in her outer world and what story was being told in her inner world. This beautifully portrays where her strength to overcome and become emanates from. The details used create a strong picture providing a connection to the reader, eliciting a visceral response. and how breadcrumbs from her One True Love.. Jesus, led her to freedom! Tennessean Tiffini Kilgore is the founder of the lifestyle and design boutique House of Belonging, selling beautiful home decor and clothing. In Kilgore’s memoir Misfit Table: Let Your Hunger Lead You to Where You Belong, she recounts her childhood and adult years, as she sought to escape poverty and brokenness and find God. Her story is captivating, and I found myself mesmerized as I read it in one sitting. Kilgore grew up quickly; at age sixteen, her parents legally allowed her to marry her boy Tennessean Tiffini Kilgore is the founder of the lifestyle and design boutique House of Belonging, selling beautiful home decor and clothing. 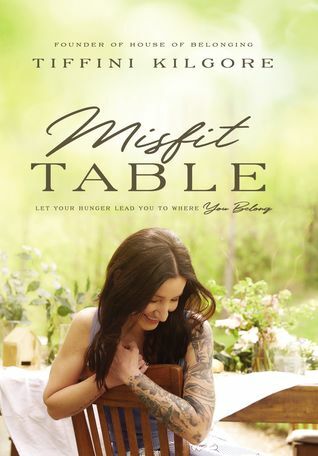 In Kilgore’s memoir Misfit Table: Let Your Hunger Lead You to Where You Belong, she recounts her childhood and adult years, as she sought to escape poverty and brokenness and find God. Her story is captivating, and I found myself mesmerized as I read it in one sitting. Kilgore grew up quickly; at age sixteen, her parents legally allowed her to marry her boyfriend, Ronnie, and during her senior year of high school, Kilgore dropped out of school to prepare for the birth of her first child. Kilgore wanted to marry Ronnie and have children to create a life far different from her turbulent childhood. Ronnie’s family had a stability that Kilgore craved, and through the ups and downs of her life, stability was something Kilgore repeatedly chased after. Misfit Table shows how Kilgore not only sought stability, but her Lord and Savior, Jesus Christ. Tiffini’s words were like healing balm to my soul. She shared some difficult things from her past and how she was able to work through them, fully relying on Jesus to see her through. She shows personal examples that would bring tears to my eyes and let me know I’m not alone! She works through abandonment, rejection, poor decision making, and more. If you’re looking for a book that will draw you in and point you to an intimate relationship with Jesus, run, don’t walk, and get this book. Misfit Table is one of the most raw and beautiful books ever written. As someone that has struggled to rectify her own childhood, it was a blessing to witness the way Tiffini found God woven through. It inspired me to look back and realize my own golden thread of protection woven through. Tiffini’s raw and intimate moments shared with her readers tug right at the heart while pointing back to God the entire time. Misfit Table is one that I will continue to read time and time again. Tiffini’s story is one of God’s unrelenting love for us, even in our brokenness. I was inspired that even through her hurt, pain and disappointment she kept seeking the Lord’s heart and trusting in Him to redeem her life. I believe that her honesty and bravery in sharing her story will bring healing to many as it draws their hearts closer to the Father. I love Tiffani Kilgore’s book, Misfit Table! She bares her soul in a guttural, honest, soul-searching voice that claims your attention. Tiffani shares her story that intertwines with God’s tenderness, mercy, and grace. She writes her hard stories, her pain, and brokenness in a lyrical style that keeps you reading. She pens the lyrics to the song the Lord told her she would one day sing to bless others. 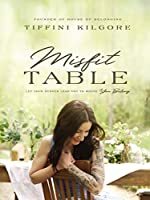 The short chapters in Misfit Table share Tiffani’s stories alongside the words God spoke to he I love Tiffani Kilgore’s book, Misfit Table! She bares her soul in a guttural, honest, soul-searching voice that claims your attention. Tiffani shares her story that intertwines with God’s tenderness, mercy, and grace. She writes her hard stories, her pain, and brokenness in a lyrical style that keeps you reading. She pens the lyrics to the song the Lord told her she would one day sing to bless others. The short chapters in Misfit Table share Tiffani’s stories alongside the words God spoke to her heart and soul. The threads of God’s love, devotion, protection, acceptance, and faithfulness are interwoven into the fabric of Tiffani’s layers of experiences and suffering. The Lord’s truths are the buffer to Tiffani’s truthful sorrows. I could relate to the spirals of pain she traveled and how she felt lost and unseen. Misfit Table touched my heart and soul in so many beautiful ways. Tiffani Kilgore’s writing style is uniquely beautiful and speaks to the depths of your soul. She bravely reveals her truths to help others reveal their own, to shed God’s light on the dark, secret places of our souls. Her stories evoked emotions that had laid dormant within my soul that needed to be unveiled. Once I started reading Misfit Table I couldn’t put it down. It filled my spirit with hope, my mind with questions for my own life experiences, and my heart with validation for the brokenness I have lived. I was reminded that, no matter what, God sees me and I have an eternal place at His table. I want to thank Tiffani Kilgore for stepping out in faithful obedience and writing the story that needed to be written, her story, God’s story. It will touch your soul in beautiful and unexpected ways. Misfit Table is an amazing book, a must read!! Once I started reading Misfit Table, I could not put it down. It's a story of generational brokenness and choices that are made when not feeling worthy of. But when we listen to God and trust that He has a plan even in the midst of the messy we experience things we could not of dreamed for ourselves. We are all misfits trying to fit at the table and by Gods grace there is always room. This is a deep story into one woman's heart, soul and the steps that lead her to where she is today. There are beautiful reflections as conversation between she and God at the end of each chapter that are a good reminder of God's presence with us wherever we are. Be prepared to read this book as memoir. I entered into the reading expecting reflection and I was not prepared for the deep and vulnerable sharing of her personal story for the first 150 pages or so. If you have experienced physical or This is a deep story into one woman's heart, soul and the steps that lead her to where she is today. There are beautiful reflections as conversation between she and God at the end of each chapter that are a good reminder of God's presence with us wherever we are. Be prepared to read this book as memoir. I entered into the reading expecting reflection and I was not prepared for the deep and vulnerable sharing of her personal story for the first 150 pages or so. If you have experienced physical or spiritual abuse in your own past know that those topics are heavily covered in the first half of the book. Tiffany is sincere in her storytelling, firm in her experience with God and her heart to speak life to others is deep and clear. Misfit Table is a beautiful God story that will touch anyone who reads it. Tiffini’s words are raw, real, and powerful. Her vignette style of writing makes the book easy to read and hard to put down. So much of her story was relatable to my life, and after reading it I’m wishing we could sit down for a cup of coffee and talk about all the ways God’s worked similarly in both of our lives. Five stars and two thumbs up!